The Seventh Annual SFR Galaxy Awards are being announced today in seven rounds, beginning at 10AM Eastern time. 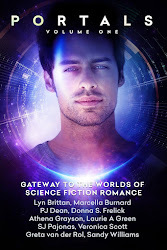 Please join us in celebrating the only exclusively Science Fiction Romance awards by visiting the website, congratulating the winners, and sharing the links on social media. Many congratulations to all the winners today! In case you haven’t heard, the 2018 SFR Galaxy Awards are coming…tomorrow! The SFR Galaxy Awards are an annual award event for the science fiction romance genre only. These awards are announced every January 31st, and this year’s awards feature seven rounds beginning at 10AM Eastern time (9AM Central, 8AM Mountain and 7AM Pacific) and continuing until 4PM Eastern. This marks the 7th anniversary of the awards. The concept for the awards was created by Heather Massey after being inspired by a quote from acclaimed SFF author Ursula K. Le Guin, and the awards were founded by Heather Massey and Laurie A. Green in 2012. The SFR Galaxy Awards is not a voters’ choice award, nor is it a writing competition. The panel of seven judges--who are all avid readers of SFR books, as well as book reviewers, book bloggers, librarians, and/or editors--choose their selection(s) from the general pool of SFR books available, whether traditionally- or self-published, print or digital, of any length, subgenre, or heat level. The only criteria is the book must have a cover and must be available to purchase or download (free books are eligible). The focus is Sci-Fi Romance books published in the awards year, but judges may also choose a book published in a different calendar year, or a SFR movie, television show or game. The judges make their selection(s) of outstanding SFR books and/or elements and may choose to include a write-up of why they made the selection. They also create the title of each individual award, which can range in tone from serious to fun. See the SFR Brigade Recommends post yesterday for examples of some of the previous awards. The overall purpose of the awards is to recognize outstanding science fiction romance books or outstanding elements they contain, and to connect readers with books they want to read. Where can I Find the Awards? The award rounds will begin posting every hour starting at 10AM Eastern time tomorrow. If you read or write Science Fiction Romance, these are your awards! Please help get the word out by sharing the announcements via Facebook, Twitter and other social media (there are convenient buttons below each post or you can copy and paste the links to the award rounds, if you prefer). SFRB Recommends: The SFR Galaxy Awards! This month, the SFRB Recommends highlights the upcoming SFR Galaxy Awards. The SFR Galaxy Awards give the judges the freedom to choose what they found noteworthy for their awards, so the award names are often creative in their own right! Here are a few inventive awards given in previous years. Fun, right? Previous awards are a great way to expand your TBR pile. This year's awards will be announced Thursday, 31 January.